So you can, well, *nail* your favorite. 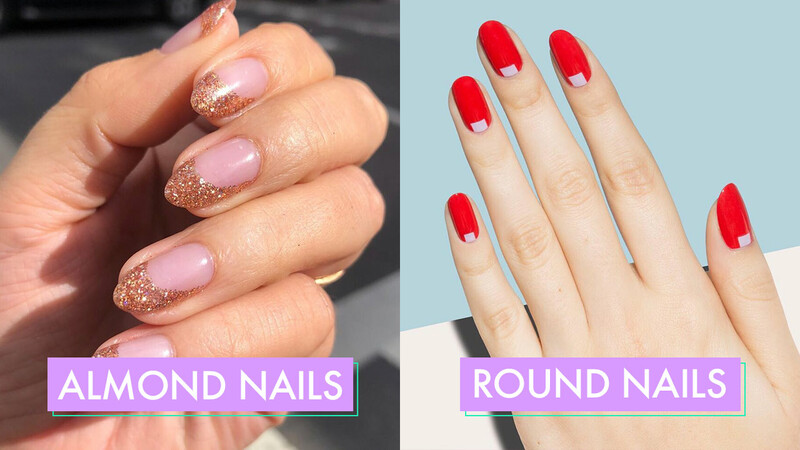 Whether you prefer a more basic nail shape, like round or square, or an extreme look, such as a stiletto or coffin tip, here's exactly what you need to know to pull them all off. "This is a very soft, natural look that's easy to maintain—even if you break a nail, you can sacrifice a little length and still keep the shape," says nail stylist Miss Pop. Can't grow your nails long? This is your go-to! To differentiate it from its cousin, the oval, "think about mimicking the curve of your cuticles," suggests nail pro Jin Soon Choi. Move a nail file "side to side to create the gentle arc," notes Miss Pop. Who can wear this shape: "It works best on nails that are short or that have grown slightly over your fingertips," she adds. This shape is deceivingly difficult to execute, since the slightly tapered shape can easily veer into almond or round territory if you file too much or not enough. "It takes patience to file this shape—so go slow," says Miss Pop. Who can wear this shape: Have short nails? This shape won't work unless you add acrylics or gel overlays. "But if you flip your hand palm side up and can still see the tips of your nails, then you can definitely create this shape," says Miss Pop. Unlike an oval nail, which has only slightly tapered sides, this shape is its more extreme counterpart. "It's very glamorous," says Choi, "and gets its name because the entire nail looks like an almond in that it's elongated at the tip with a round base." Who can wear this shape: It works best on medium to long nails, since plenty of length is required for it to be noticeable, she adds. Arguably the easiest shape to create, "all you need to do to achieve it is simply file back and forth across the top of your nail," says Miss Pop. But just because it's the simplest to create doesn't mean it's the easiest to maintain. "The corners tend to get jagged, so you need to slightly buff them to make them smooth," suggests Choi. "When filing the sides, make sure to keep the file perpendicular to your nail, and be careful not to apply too much pressure or the edge or this will take on a concave U-shape versus staying straight and boxy," she explains. Who can wear this shape: Natural and fake nail devotees can sport this look, but "it tends to look best on those with long, narrow nail beds," explains Choi. "This square-meets-oval hybrid is my favorite because anyone can wear it—whether you have short, medium, or long nails—plus, it's modern and soft," says Choi. The catch? It's easy to mess up. "Many people make the mistake of filing straight across the top, and then curving the corners, which is actually square with round edges, not a true oval," she explains. But the true key to nailing this shape is creating a subtle arc at the top of your tips, and then connecting the sides so there is a natural taper," she explains. Who can wear this shape: Like Choi said, it suits any nail length! Named after a pair of sky-high heels, "this shape is a statement," says Miss Pop—"it's both dramatic and high maintenance." Because stiletto nails call for super-tapered sides that help create their signature pointy center and extra length, you need to commit to extensions (and asking for assistance to open a can of soda). Who can wear this shape: "There's no such thing as a natural stiletto nail, since they'll break too easily in this shape," she adds. "So you'll have to have an enhancement to reinforce it." Choi also recommends getting a gel overlay verses acrylic to increase the length. "Acrylics can look thick, which is why I prefer using gel instead, since the shape will always look more elegant," she notes. Celebrities like Kylie Jenner and Khloe Kardashian, Ariel Winter, and Halsey (to name a few) have all made the coffin shape Insta-famous. "It's the new stiletto," says Choi. As for the shape, because it looks like a coffin, it requires strongly tapered sides with a very straight edge on the top. Who can wear this shape: Unfortunately, pros say this nail shape is not for everyone as it needs major upkeep and length. Natural nails are typically not an option here unless you're insanely blessed in the length department. Consider this shape the stiletto's softer-edged cousin. It's named after the top part of a ballerina's pointe shoes, which have slightly convex sides and a straight tip. To copy this fresh look, Miss Pop recommends filing your nail in a perfect oval shape, and then square off the tapered tip. Who can wear this shape: Unless you have hard AF natural nails, you'll likely need acrylic or gel overlays to get the strength needed to keep your tips from breaking.